Update: It appears as though this set has been cancelled or postponed indefinitely. Everything is prim and proper again with 2015 Cryptozoic Downton Abbey Seasons 3 and 4 trading cards. British society and culture at the dawn of the 1920s are on display as generations collide and look to find their way in a changing world. But that's all shown in the show. As for the trading cards, these have a similar feel to the set that covered the first two seasons. Autographs and costume cards highlight the chase, which also includes other character-focused inserts. 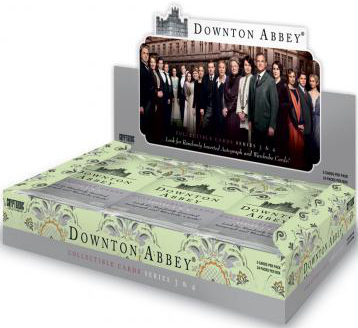 The 2015 Cryptozoic Downton Abbey Seasons 3 and 4 base set has 72 cards. All use images taken directly from the show. Odds and subjects haven't been announced, but both Autographs and Wardrobe Cards are part of the release. Wardrobe Cards include costume swatches. Given the intricate designs of the clothing worn on the show, this leaves open a lot of potential for unique pieces. 2015 Cryptozoic Downton Abbey Seasons 3 and 4 also has multiple basic inserts that mimic the first set. Character biographies are available for both the residents of Downton that live upstairs (the rich) and those that reside downstairs (the staff). Other inserts focus on memorable quotes and mini card portraits. Stay tuned for more details on 2015 Cryptozoic Downton Abbey Seasons 3 and 4 trading cards as they're released.